Remember in SheppyBrew 2018 Year-End Brewing Stats, I mentioned that I wanted to brew more new recipes in 2019? Remember in SheppyBrew 2018 Year-End Brewing Stats, I mentioned that I wanted to brew more lagers in 2019? So ... last weekend I brewed a beer that was both a new recipe and a lager. At first, I thought I was going to brew a Standard American Lager (BJCP Category 1B). This category call for using corn as an ingredient. 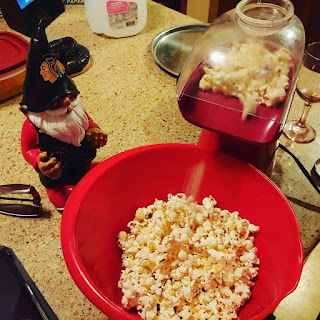 I've brewed Popcorn Beers in the past, and I thought it would be fun to add popcorn to this one too. For some reason, I thought it would be funny to make a beer name for which P.B.R. could be an acronym. Popcorn was a great start for the "P". It took me awhile, but eventually, it hit me that "Popcorn. Barley. Rye" would work for "P.B.R". I already had Popcorn and Barley as part of the recipe. It certainly isn't difficult to add some Rye. Voila ... I had the malt bill for my new lager. I designed a recipe that would fall in the American Standard Lager category. Low in hop flavor and low in bitterness. As I thought more about it, though, I didn't really want that. I wanted a little more hops. Plus, Rye doesn't really fit in an American Standard Lager beer. So, I increased the hops and pushed the beer into more of a pre-prohibition lager. 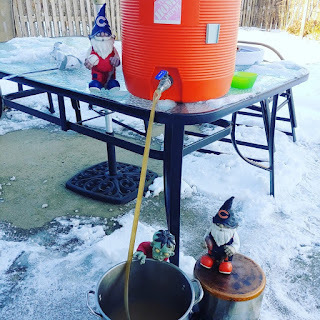 I brewed this on Sunday January 20th. I got a late start compared to my usual brew day. 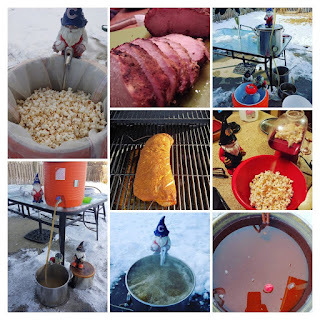 I heated up strike water at the same time I popped the corn. 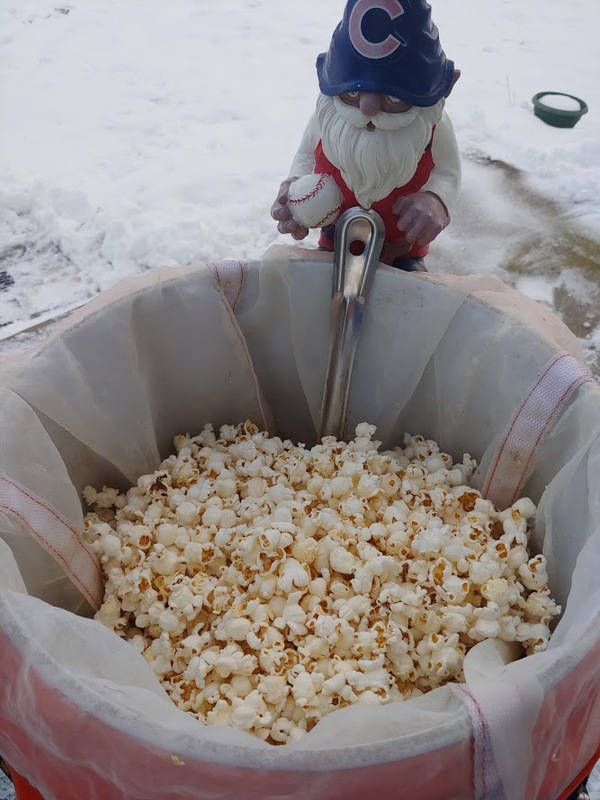 1 pound of popcorn takes quite a few batches to get popped in one of those little air poppers. 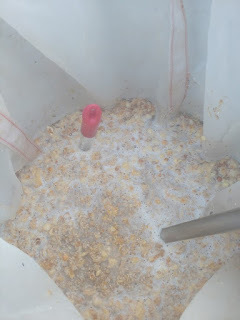 The strike water was done before the popcorn, so I mashed in the barley and rye about 10 minutes before adding the popcorn. I got the mash done. It wasn't until after 9:15 that my wort was collected. I started my boil timer at about 9:30. 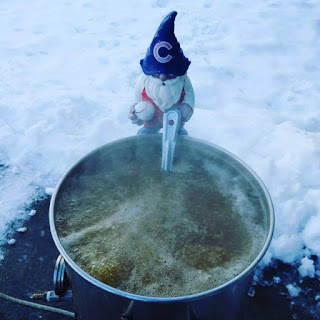 The boil went fine. My pre-boil gravity was a bit high, but not too bad. 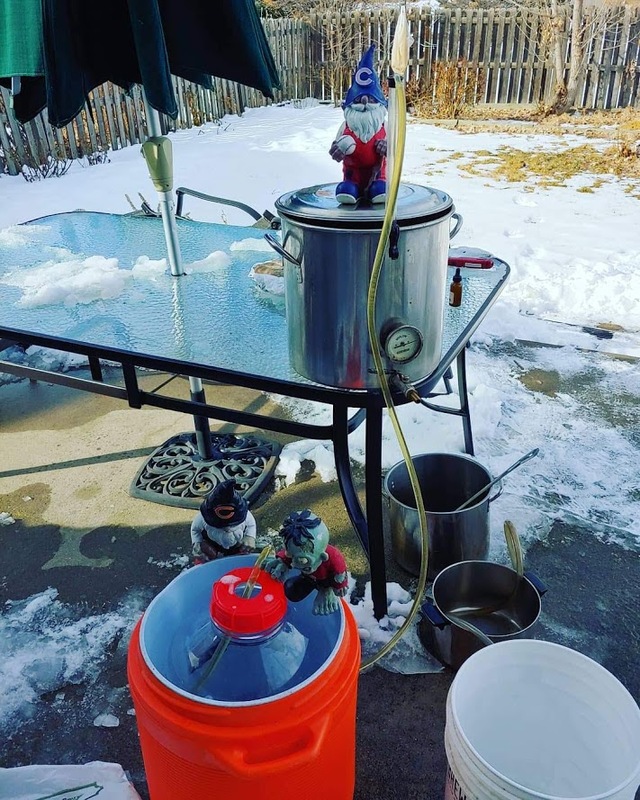 Around 10:30, I started chilling the wort. As a point of reference, my last brew day, I was completely cleaned up by 10:15. It felt sort of weird to have so much left to do this late in the brew day. My OG came in at 1.045, which is very close the the 1.046 that the recipe predicted. Since this is a lager, chilling took quite awhile. I didn't pitch the yeast until after 2pm. I got the fermentation temperature right at 50 degrees. It took a few days to really get started. But, now, the fermentation is pretty much done and I just need to dry-hop. 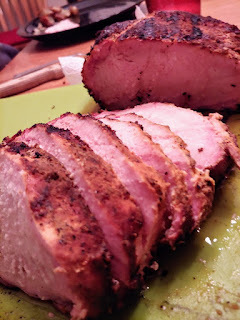 I also smoked a pork loin on this particular brew day. 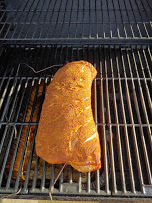 The loin only took a couple hours to reach 142. I wrapped it in foil, and put into a cooler until dinner time. It was yummy and also yielded quite a few leftovers, which is always awesome. Anyway, I should be dry-hopping the PBR in the next day or two. I expect I'll have it kegged and ready to drink in another week or two. I'll let you know how it goes ... keep an eye on the regular SheppyBrew Channels to see what is happening with beer and other things: SheppyBrew's Facebook Page; Sheppy's Twitter Feed;SheppyBrew's Instagram Page; and SheppyBrew's Website. Of course, don't forget to visit this blog often as well!